The colorful joy of the Carnevale of Ivrea , held on the traditional carnival date, 40 days before Lent. Ivrea is a small city about 40 minutes North of Turin. It was a “computer city” while it is the headquarter of Olivetti, an Italian famous brand in this sector. 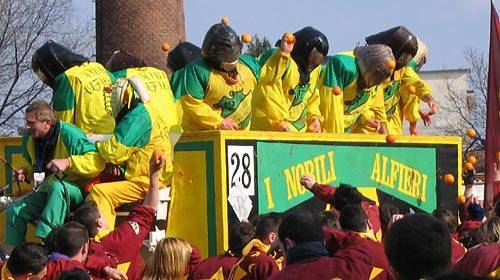 The computer industry has gone East, but its everlasting fame has connected to one time a year during Carnival: in Ivrea it takes place a unique, exciting, ancient and “juicy”…orange battle! The battle is an allegoric record of a local insurrection in 1194. It was a revolt against the Holy Roman Emperor Frederick of Swabia Barbarossa (Red Beard). Violetta, a local heroin, was the one who started the insurrection, which resulted in the destruction of a castle. In the center of Ivrea and by the left bank of the River Dora, on battle day, thousands of red juicy oranges to throw as well as a long “carpet” of already crushed oranges that could reach a foot high is waiting for you! Together of course with loads of “Vin brulé” glasses to drink,and on the horizont you will see horses pulling high carriages full of helmeted and armored warriors of the tyrant, while Violetta la Mugnaia (the miller) arrives on a low carriage, while throwing yellow mimosa flowers and candies at the crowd. A moltitude of red hats called Phrygian hats (berretti di Frigia or berretti frigi) coming from the ancient area of Phrygia (Turkish Anatolia) symbolizing freedom that is the red bonnet symbols of the French Revolution!!! You must go into the battle areas, remove your hat to join the battle. Near the battle areas there are protective nets, though, for the visitors. The carriages with the representatives of the Emperor soon will get surrounded by unarmored orange-throwing audience in medieval costumes. The exchange will be throwing hundreds and hundreds of oranges!! The Old Bridge area is the most fantastic “war” scenerio. The streets are very narrow and so the orange pulp piles up so high that a snow-removing tractors is needed to clear it!!! Fifty years ago they allowed to throw oranges from the windows too. But now everyone are not targeting red-hat “civilians” while the river at the end of the battle will carry tons of oranges!!! This entry was posted on Tuesday, November 15th, 2011 at 1:30 pm	and is filed under Events in Italy. You can follow any responses to this entry through the RSS 2.0 feed. You can leave a response, or trackback from your own site.